Today is International Day of Zero Tolerance to Female Genital Mutilation (FGM). We need this day to help raise public awareness of FGM; a despicable and hugely damaging practice that is estimated to effect some 200 million women and girls worldwide. In some parts of the world the practice is culturally accepted, as is the marriage of girls barely in their teens. Often the two issues go hand in hand. The key to tackling these insipid and widespread practices, so damaging to young girls and women, is to change the mindset that enables it. Very often that means working in small rural communities, using education and awareness as the first tools of change. That is exactly what ChildFund is doing in Guinea, where FGM is widely tolerated. In order to facilitate open dialog about this important social issue, ChildFund held discussion sessions with secondary level students about violence in school, child marriage and female genital mutilation. Such sessions are led by the children themselves with a focus on, causes, types, consequences, solutions, and both the roles and responsibilities of practitioners. Summary results from the discussions were presented to the government and commitments were taken on by their representatives, working together with INGO’s and local NGO’s to help eradicator this blight on the lives of young women and girls. Crucially, the sessions served to provide a platform for victims to talk about their experiences and for others to learn from them. Here, a brave young Guinean woman, Mariame, recounts the impact of marriage and FGM on her life , and why the work of ChildFund to challenge these damaging practices is so important. With thanks to Arthur Tokpah, ChildFund Guinea. “I should have graduated from high school like my friends,” Mariame says. But like many young Guinean women, she felt pressure to marry. Yielding to local tradition, Mariame wed an older man when she was only 13. He moved her to the capital city of Sierra Leone, where she didn’t know anyone. For the next five years, Mariame lived with her husband, who didn’t treat her well. Then he threw her out of his home because she had not had a child yet. He said he was going to marry someone else to bear him children, so Mariame returned home to Guinea. Her father had died while she was away, so now, at age 18, she lives with her mother. She’s finally returned to school. Mariame shared her story during a forum, one of three public events hosted in March by ChildFund Guinea and our local partners in Kindia and Dabola. Young men and women ages 12 to 17 took part in discussions on early marriage, female genital mutilation and school violence, and adults listened closely. Early marriage and FGM, also known as female circumcision, are common problems in Guinea; according to UNICEF, 96 percent of girls and women between the ages of 15 and 49 in Guinea have undergone circumcision, which is meant to decrease women’s libidos and often leads to infections and sterility. Guinea has the second highest rate of FGM in the world, and most girls experience this brutal procedure when they are 12 or younger, even though it has been illegal in Guinea since 1965. Another national law is supposed to prevent men and women from marrying before they’re 18, with or without parental consent, but a 2015 report showed that 21 percent of Guinean women ages 20 to 24 were married at age 15 or younger, and more than half were married by age 18. Most have little or no choice in the matter. Early marriage leads to high illiteracy rates among women, greater maternal mortality rates and other problems that perpetuate poverty. Because these issues are rarely mentioned in public in Guinea, the March forums broke significant ground in promoting open discussion. Poverty is a major reason behind early marriage both in Guinea and in other countries. Grooms may pay a girl’s family a dowry for her hand in marriage, and usually her living expenses become his responsibility. Also, Guinea also has a tradition known as the Soroya system. If a wife dies, her widower may marry his wife’s younger sister, who is offered by her parents to keep a good relationship with the husband. On the other hand, if a husband dies, any of his brothers can take his widow as his own wife. The woman’s preference is not taken into consideration. Young participants in the forums advocated for more conversation about the consequences of female circumcision and early marriage — particularly the physical and emotional effects on girls, women and communities as a whole — and enforcement of laws prohibiting these practices. In discussions about violence at school, teens called for more education and cooperation among teachers, parents, students and community leaders. 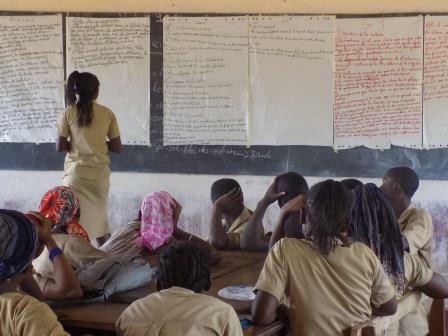 Although the prevalence of forced marriage, female circumcision and school violence in Guinea creates great challenges, student participants say they’ll continue going public with their concerns, and government officials, teachers and parents agreed that they’ll listen to their children’s words.